A new book and website linked to a recent Canadian Centre for Architecture exhibition offer a healthy tonic countering academically anemic architectural education. For the past decade I’ve worked part-time at a university teaching Canadian Studies, and that admission invariably brings a response of: “Are you Canadian?” Since I’m not, I go on to explain teaching Canada represents my payback for inspiration gratefully received from Canadian poets, musicians, and architects. Equally inspirational is the Canadian Centre for Architecture (CCA) in Montreal, an institution without parallel in North America, where architectural history, theory, practice, and architecture’s ongoing role in society are presented to a broad public through highly imaginative and intellectually sprawling exhibits, lectures, and debates. Unlike academic architecture schools that excel in Balkanizing architectural knowledge so theory, practice, and history are divvied up as separate courses (lest student minds be chaotically over-stimulated by cross-disciplinary parallels and convergences), CCA assumes anyone curious can find delight in interfacing architectural inquiry with the rest of non-departmentalized life. 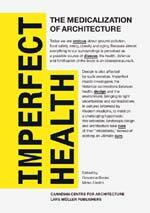 CCA’s newest book, Imperfect Health: The Medicalization of Architecture, edited by Mirko Zardini and Giovanni Borasi, showcases the robust health of CCA’s public programming when a broad topic like public health is juxtaposed with architectural design. 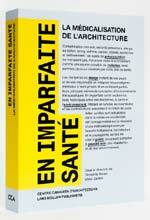 Rather than settling for simple shibboleths about how new sustainable designs for health facilities are better than ever, the 10 experts contributing to this book (co-published by the esteemed Lars Müller Publishers) examines the porous relation between architecture and public health from a variety of novel angles. “Tell the truth, but tell it slant,” was Emily Dickinson’s credo, and these writers tilt everywhichway controversially. Editors Zardini and Borasi make clear in the book’s introduction that architectural design has long been associated with medical metaphors, and that these metaphors need critical analysis. The language of 19th-century urban planners bulged with rhetorical references to health and hygiene, as does our era paint cities’ varying shades of “green,” our most common synonym for sustainable physical and mental well-being. We call for “healthy” and “smart” buildings – a transfer of medical rhetoric to architectural discourse, symptoms of what the editors call “the medicalization of our society” drifting into widespread design thinking. The implications of thinking about architecture through medical language unsurprisingly possess both salutary and unsavory consequences. On the plus side are buildings like La Tour Vivante, a project designed by Paris-based SOA Architectes that recasts the urban vertical garden festooning skyscraper façades into a housing and office tower internally ribboned by dense hydroponic farms. As Olmsted imagined Central Park as New York City’s “lungs,” SOA’s design re-visions a mixed-use urban tower as a multiple work and pleasure nerve-center, as intricately intertwined as neuron-filigrees in one’s brain. On the dubious side, David Gissen’s “A Theory of Pollution for Architecture” cheekily asserts that “rather than position architecture as an endless refuge from the pollution of the city, it becomes the context through which we come into contact with the city’s degraded and amorphous historical matter.” Perhaps Gissen’s intent is tongue-in-cheek as he waxes nostalgic about how the once omnipresent scent of urban coal smoke “has been replaced by the smell of restaurants’ wood-burning pizza ovens.” Gissen is likely just arguing for pollution and toxic substances of all ilk being mined as topics for architectural research, although CCA’s heady cross-disciplinary programs can sometimes encourage heedless Monty-Python-like absurdities from some quarters. Over the last decade, great strides have been made toward understanding habitat hazards by environmentalists, physicians, community and public health experts, social workers, psychologists and urban planners. Nonetheless, PDD (Place-Deficit Disorder) is not being addressed as consistently, expeditiously and thoroughly as it could and should. Why not? ... Today, a plethora of urban prescriptions and self-help books promise to heal what ails us, rarely recognizing the obvious, yet oddly overlooked inextricability of people and place. Bottom line: the best of sustainable architecture can not save us from ecological ruin. Required is a new comprehension of “context” in design. “Context” is not ever less than global. Meanwhile, Imperfect Health: The Medicalization of Architecture assembles all the most nagging, often unanswerable, questions about viewing architecture through the metaphors of medicine. To the CCA editors and guest contributors, a salute: to your – and our – and the planet’s – health.